We all know the saying, “an apple a day keeps the doctor away.” But what if you can’t afford the apple … or any other vegetable? One in four American children regularly goes hungry. So, one San Francisco hospital developed an innovative program. Monika Russi is always on the prowl for ways to keep her son healthy, especially after he was diagnosed with Autism last year. She was surprised when doctors pulled out their prescription pads and ordered food, not pharmaceuticals. “Being a single mom with two kids and trying to eat healthy is a challenge most of the time,” explained Monika. Twice a month, low-income patients can pick up fresh produce, lean protein and whole grains free of charge. 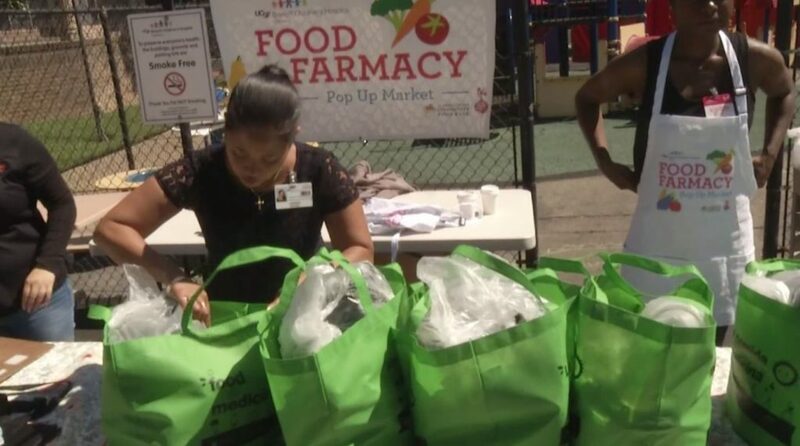 The food ‘farmacy’ program comes after a four-month hospital study where patients were prescribed food as their ‘medicine’. “And what we ended up finding was that it improved not only the health of the household, but we also saw changes in the children,” stated Larissa Estes, DrPH, UCSF Benioff Children’s Hospital Oakland. “I’m a medical doctor and I prescribe medicine but I always like to take the natural approach whenever possible and food is medicine,” shared Gena Lewis, MD, UCSF Benioff Children’s Hospital Oakland. The study also revealed healthy eating not only alleviates symptoms among children, it can even reduce the impact of chronic diseases among their parents. Monika says the difference in her son since starting the program is remarkable. “It does alleviate a lot of the symptoms associated with some of his medical challenges,” Monika said. Doctors also report once children are introduced to more fruits and vegetables, they get more interested in trying new fresh foods. Other programs similar to the food farmacy have sprouted up in Pennsylvania and Boston.